In the city, we’re constantly saturated with the radio waves from 10 or 20 different routers, cell towers and other wireless infrastructure. But in rural communities there might only be one internet connection for a whole village. 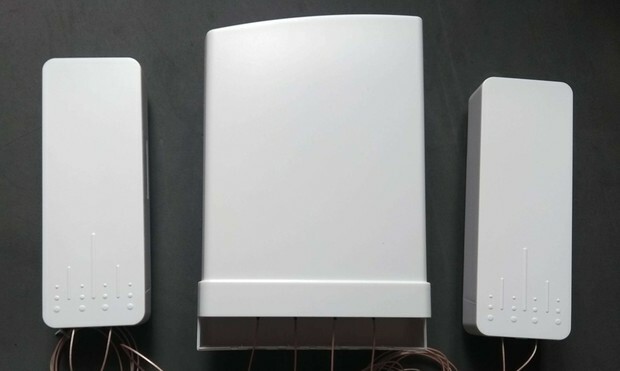 LibreRouter is a hardware and software project that looks to let those communities build their own modern, robust mesh networks to make the most of their limited connectivity. The intended use case is in situations where, say, a satellite or wired connection terminates at one point, the center of an area, but the people who need to use it live nearby — but well outside the hundred feet or so you can expect a Wi-Fi signal to travel. Often in such a case it’s also prohibitively expensive to run more wires or install cellular infrastructure. So instead of having people come to the signal, you bring the signal to them with a mesh network: a collection of interconnected wireless routers that pass signals to and from anyone who can reach one of them. This approach has its own problems: routers can be expensive and difficult to maintain or repair, and the network itself isn’t trivial to set up and troubleshoot either. Off-the-shelf routers and software aren’t the best options — so a team of concerned hackers have put together their own: LibreRouter, and LibreMesh, the software that runs on it. It’s not some groundbreaking device or fancy software — just purpose-built for use by communities like the ones they’ve tested with in rural Argentina, Mexico, Spain and Canada. The goal, as LibreRouter’s Nicolás Pace explained to APNIC, is to make mesh networks affordable, robust, scalable and simple to operate; they’re not all the way there, but they do have a working prototype and full software stack based on OpenWRT, a well-known and trusted wireless utility. They’ve designed the router itself to be modern and powerful, but easy to repair with normal tools and off-the-shelf parts; the software won’t quite be one-click simple, but it should automate many of the harder parts of configuring a mesh. The range on them is in the kilometers rather than meters, so these can really connect quite a large area. It’s all open source, of course, and the team is always looking for contributors. There’s enough interest, Pace said, that they might ship as many as 2,500 of the devices over the next couple of years once the design is finalized.